In an attempt to escape the creepy cold front approaching D.C., the women are sending a top notch squad of Kristin, Teal, and Julie down to the Raleigh City of Oaks Half Marathon. Coach Jerry Alexander reports that he's spooked by the possibility of how fast they will run. "Kristin is ready for another major PR. She broke the 60 minute barrier at Army, and while I don't like to make predictions, I think she'll break another significant barrier on Sunday," he boasted. "Teal and Julie will be running hard in their final tune up for Sacramento. They're both sharp and ready to roll, and we should see significant PRs from both of them." Closer to home, Luke, Sam, and masters stud Pat Kulhmann plan to lay the ol' hocus-pocus on their competition at The Parks 10k. 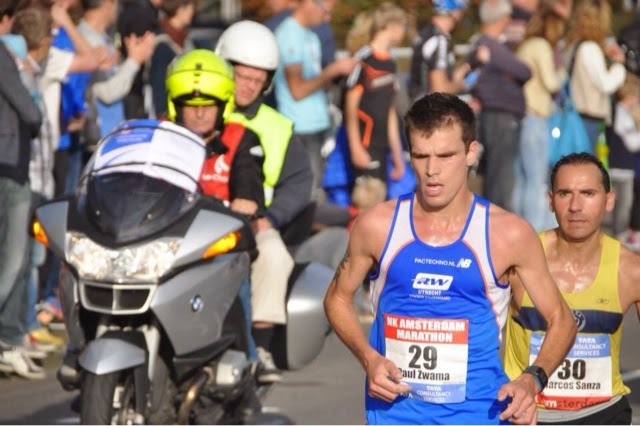 "Luke is preparing for all-out efforts at the USATF 12k and Clubs," Coach Jerry reports, "so he's using this as a hard tempo, which will work out well for Sam, as the two of them should be able to work together for significant portions of the race." A short broomstick ride away will be the inaugural Stache Dash 5k in Arlington, where Kevin, Dave O., and Elyse will all be aiming to raise the dead with some fast times. Perhaps most notably, Chuck "Big City" Kascur will be guiding visually impaired athlete Matthew Rodjom in the National Race to End Women's Cancer 5k. It might take a strong potion or spell to get Big City through a race many times longer than his norm, but Alexander has the utmost faith that Big City will make it through. Clearly, big things are brewing in the cauldron for this weekend, so be sure to check back here for the latest! Luke, Sean, and I are meeting at Greenbelt tomorrow at 11:00 (late, for those who want to do some MCM spectating). We'll be hitting the trails for about an hour and fourty-five minutes. NOTE: We are going to meet in the parking lot in the center of the park - shoot me an email if you are unsure of where to go. The clock was Kevin's only opponent at the St. Rita's 5k on Saturday, in more ways that one. Due to a lengthy delay on the yellow line, Kevin arrived on the starting line less than a minute before the gun went off, and had no warmup. But once the race started it was smooth sailing as Kevin ran unchallenged for the win in 15:10, which was a course record. I'm going to go out on a limb and say that if Kevin had been able to warm up, and if there was someone within 90 seconds of him, Kevin would have run a tad faster. In the women's race, Tina ran a very solid 18:31, and Elyse made her long awaited return to racing. While Elyse's result was not stellar, it was a welcome first step in her comeback from injury. Finally, at the Gettysburg XC Invitational, Dickson returned to the scene of his collegiate glory to run a strong 27:20. We're at BCC this week for our normal 7:15 start, so meet for the warmup at 6:30. We'll have practice on Saturday, and the plan is to transition to actual workouts on the grass, as opposed to tempos. The big races are sneaking up on us fast, so it's about time to get down to business. See you out there on Wednesday. It was the second time he has run 2:39 in as many weeks. Teal has a great blog. Any of her posts would be worth cross-posting here. But I think her latest post, in which she recaps her Army Ten-Miler experience, is a particularly good one: not just because she averaged faster than her 5k PR and set a 10k PR on the way to a new personal best for TEN miles ... but because it really exemplifies the power of persistence and positive thinking - or, as Teal puts it, No Negative Self Talk. "Anytime I thought I couldn’t do this, couldn’t keep this pace, couldn’t keep running, I would just bat it away. Bury that thought somewhere else. Because most of the time when you think that, you are still doing it: still running, still keeping the pace. Often, it’s only after you tell yourself you can’t that it becomes true." It was a huge weekend for the GRC women as they successfully defended their team title at the Army 10 Miler on the strength of several excellent performances. Kristin ran 59:40, which puts her 5th on the all time GRC list, and proves once again that she is a superstar in the making. Kristin's improvement over the last 6 months has been nothing short of remarkable, and she's just getting started. Teal ran a humongous PR of 60:19, which is unquestionably the best race of her career. Teal had a great training cycle in the spring and was disappointed to have an off day at Boston, but her performance on Sunday demonstrated that she is in the best shape of her life, and that her big breakthrough in the marathon is coming in Sacramento in December. Julie ran a very nice PR of 60:50, and she too will be ready for a major PR in Sacramento. Amy's 61:02 was not a PR, but she went out hard and hung on tough, and she will have much better days in a GRC singlet. Also for the women, Emily won the Glory Days 5k xc in a solid 19:25. There was some very nice performances by the men over the weekend as well. At Army, Sam led the way in 51:39. Sam is still showing the affects of some nagging injuries, and was not able to sustain his aggressive early pace in the later miles, but he is working his way back to full fitness, and will be ready to impress later in the fall. Sean O'Leary made a successful 10 mile debut in 53:00, and he will continue to improve as the season progresses. Evan, who has been hindered by some nagging injuries, was close behind in 53:03, followed by Dave Wertz in 53:21. The best performance of the day on the men's side may have come from Tom, who ran a huge PR of 54:21, and set 8k and 10k PRs on route. Tom is a miler, but based on his recent massive improvement in the longer distances, we may have a new addition to our esteemed track 5000 group. In non-Army results, Ryan kicked off his fall season with a a very comfortable win at Glory Days in 16:07, followed by Charlie in 16:48, and Dave O in 17:07. Finally, Kieran ran 1:07:59 at the Mohawk Hudson Valley half marathon. The early pace was quite slow, leading to a huge negative split, and by Kieran's estimation he ran the last 6 miles in approximately 30 minutes, which is certainly a testament to his fitness. We're at BCC tomorrow for the normal 7:15 start, so meet for the warmup at 6:30. GRC Women Defend their Team Title! Chris "Silent Thunder" Bain rolled to a 2:39:50 in today's Hartford Marathon, good for 17th. Bain ran a characteristically disciplined race, going through the half in 1:19-mid and maintaining pace for the rest of the race. Early reports indicate Bain was setting up a negative split but his efforts were frustrated by GI issues. The leaves have started to change, there's a slight chill in the air, and the Redskins are already playing like garbage. For many a DC runner, that means its time to build off the countless miles trudged in the summer swamp and get to real racing. The men and women of GRC are no exception, as the squads will take to roads and trails near and far in search of solid mid-season marks. Here in the Nation's Capital a band of GRC women are out to defend their 2013 team title at the Army Ten Miler. As the second of three fall military sponsored road-races in the DC area, Army Ten always brings in fast fields and good completion, along with an absolutely ENORMOUS main pack. GRC's female contingent is anchored by a strong crew of road race vets in Teal, Maura and Julie, and bolstered by a new(-ish) members Kristin and Amy. Coach Jerry has high hopes for the women, quipping that "Maura, Julie, and Teal are all looking to run big PRs" and that "Kristin and Amy both have a good chance to move into the GRC top 5" all-time. The men meanwhile bring together a diverse group of event specialists, borrowing Evan and Murph from the marathon crew and Sam, Wertz, O'Leary and Fridge from the shorter distance squad. Sam will build off of his strong showing last week at Paul Short to take a crack at his PR, and the ageless Dave Wertz looks to be in PR shape. After a strong string of shorter road races, Sean O graduates to the big leagues with his 10 mile debt. Exciting things to come. Several time zones away, Mike Franklin will grab the sash and take on some of Japan's best collegiate distance runners as a member of the Ivy Alumni team at the Izumo Ekiden this Monday. This uniquely-Japanese road-relay race pits several top universities against each other in a nationally televised throwdown, and has included an Ivy Alum team for the past few editions. Mike joins Luke, Sam and Phil as former Heps greats chosen for the Ivy Select team, and this year's squad looks primed fro a strong showing. For a more in-depth preview check out this article on japan running news. Mike was originally gearing up for Army 10, so he's hoping for one the longer legs in the mixed-distance medley. 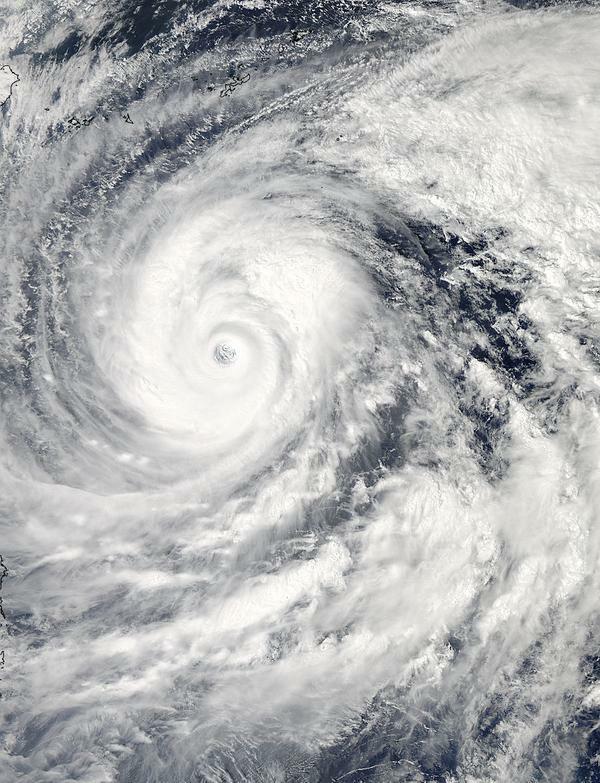 a storm only recently downgraded from "super typhoon" status bearing down on mainland Japan. Wuh oh. Across the Potomac at Bull Run Regional Park, our friends at PR Racing host the Glory Days Grill Cross Country Invitational. The men send a crack squad of Witty, Charlie, Karl and Dave O, while the women are led by the duo of Sara and Emily. Witty will make his season debut on the grass, and Karl makes his return to racing after a long layoff and a successful pacing job last weekend at Wilson Bridge. Jerry is excited for Sara's race as she "is quickly getting into shape and will be ready for a strong effort." Up North, Kieran "K-Dot" O'Connor will hop in the Albany Half as a hard-training tempo in preparation for longer races to come. Keep it here for results and updates all weekend long. Murph and I are going an easy 45 minutes from the store if anyone wants to join in. You can go further, but that's your own business. We had some strong performances on the roads and on the grass this weekend, in several time zones. On the roads, Paul Balmer made a successful marathon debut, running 2:35:53 in his native Portland. Paul lacks experience at the longer distances, but he is not lacking in talent and youthful enthusiasm, and you can expect to see continued progress from him in the months and years to come. 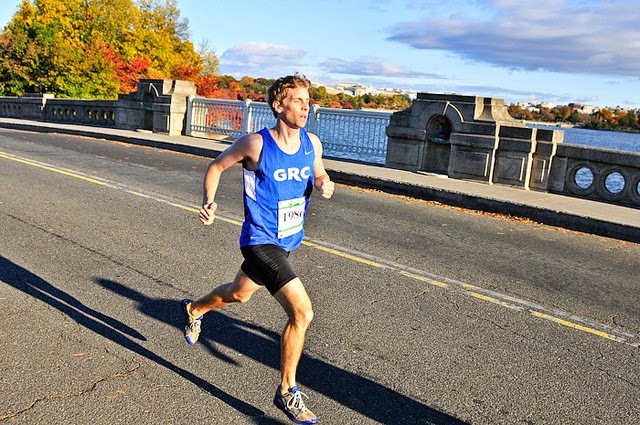 Closer to home, Luke and Kyle were in action at the Wilson Bridge Half Marathon. Luke ran 1:07:29, and although he was the second American, this qualifies as a poor race by Luke's lofty standards. 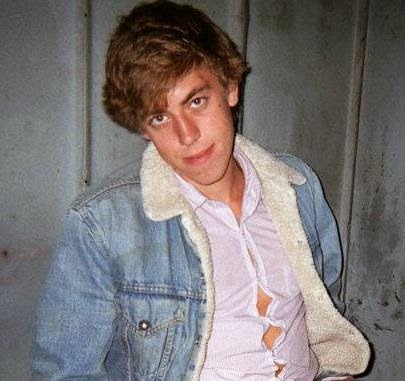 But not to worry, Luke has been training extremely well, and he will be at his best at the USATF 12k and Clubs. Kyle ran 1:16:28, which is not indicative of his fitness. Kyle was running well through 9 miles, but he suffered from hamstring problems at that point and slowed appreciably. Kyle will bounce back, and be ready to show what he can do in the coming weeks. Karl also ran Wilson Bridge, but he was not racing. Rather, Karl served as a guide for visually impaired runner Matthew Rodjam, and he led Matt to the visually impaired national championship and a big PR of 1:20:54. In our continuing effort to give back to the running community, GRC has furnished guides to elite visually impaired athletes at Wilson Bridge each year of the race's existence, and every one of our athletes who has volunteered for this service have raved about the experience. It's something that I'm proud to be a part of, and which I know we will continue to do in the future. As for Karl, we will see him back racing in the near future as he continues his comeback. On the grass, we had a crew at the Paul Short Invitational at Lehigh. Sam, running on his home course, led the way in a very strong 25:07. Sam has been limited by nagging injuries for the better part of the last 18 months, but his performance on Saturday proves that he is well on his way to full fitness. Stewart made a successful Lehigh debut in 26:10, and bolstered his dark horse candidacy for a shot at the A team at Clubs. James ran a solid 26:40, and after a very slow first mile, Dickson ran a strong second half of the race to finish in 27:07. Finally, Phil ran 25:29 at the Chile Pepper Invitational at University of Arkansas on a challenging course. Phil has rebounded from some injury issues, and in his words is "getting his legs back under" him, which bodes extremely well for the future. We'll be on the mall on Wednesday for a 7 pm start, so meet for the warmup at 6:15. I'll be out there to watch your stuff during the warmup. We'll meet at the same spot as normal, which is the 7th street side of the loop. If you have any questions about logistics, let me know. I'll see you Wednesday on the mall. 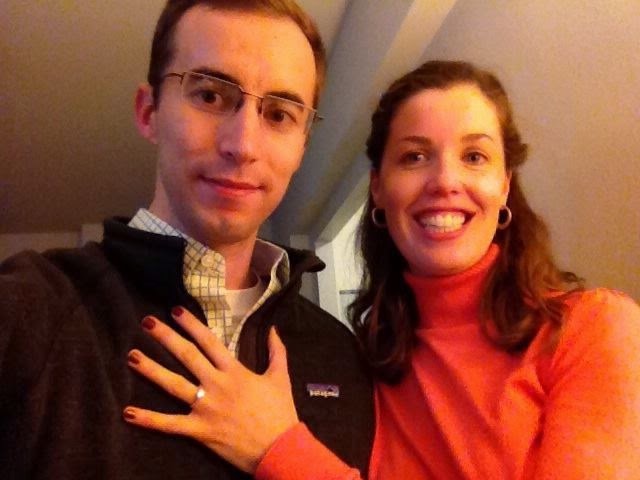 Yesterday Chuck "Big City" Kascur popped the question to his girlfriend Kate Burke. And that question was NOT "what's your 800 meter PR?" Instead, the Chuckwagon asked Burke to marry him, to which she signed on for a life of big city living and said "yes."